*This experience was sponsored by Paris Las Vegas Resort & Casino, and we thank them for hosting our family for this fun weekend adventure. It’s hard to believe that in all the times we’ve been to Las Vegas (and that is a LOT), we have never stayed at the Paris Las Vegas Resort & Casino. Until now. And honestly, I don’t know what we were waiting for. It’s a perfect place for families with kids, and we had a blast! First of all, there is nothing like walking from that hot weather into the perfectly chilled air inside the Paris Vegas. We valet parked the Kia from our big road trip, running from the car and avoiding chatter with the nice bellhop who unloaded our bags from the hatchback. Once checked in, we ascended to our gorgeous rooms – the girls were thrilled after several of days of sharing with their parents to have an adjoining room and bathroom of their own. We’re told the rooms have recently been remodeled, and they were stylish in a chic, modern way with red lacquer accents, cool grey and white print carpeting, and bright red drapes with white patterns. Our rooms were clean, spacious and well appointed. 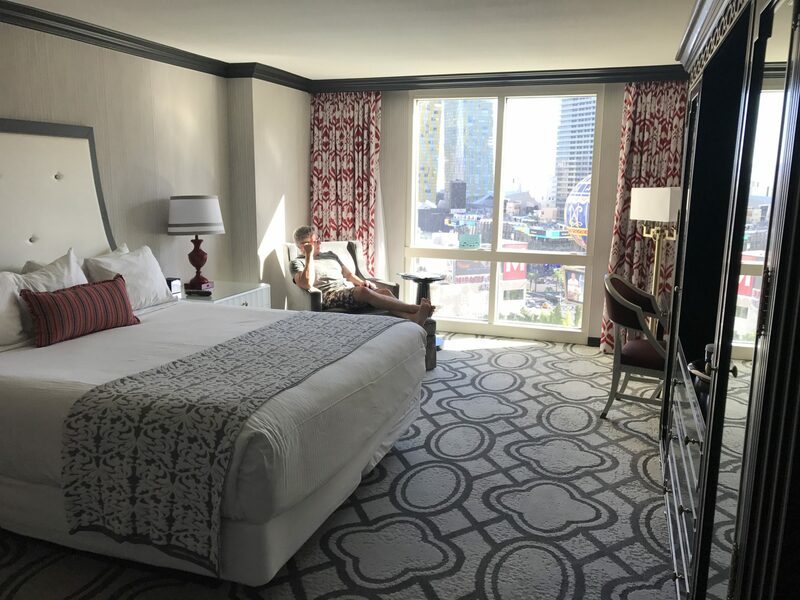 Our room at Paris Las Vegas was snazzy, and how about that amazing view?!? Best of all, the view was spectacular. Our rooms looked out directly over the pool, and we could spy on all the guests flapping around in the cooling water. Behind the pool, the Eiffel Tower rises high overhead and for a second I was confused about where we were! The Paris theme is done well, and not overdone like some Vegas hotels that have taken their themes to the extreme. The check-in lobby looks like the Hall of Mirrors at Versailles, and the legs of the Eiffel Tower jut into the casino floor which makes it seem all the more authentic. The shops and restaurants meander through the main floor, like a Paris street scene with colorful architecture and scenes. And the best thing? La Creperie! There is nothing like a freshly made Nutella crepe to bring your memories right back to the street corners of Paris. The taste is out of this world, and I was so happy to have one at Paris Las Vegas. Yum! Nothing better than an authentic Nutella crepe. Of course the kids love a good pool, and so do we. I’ve been in a few Vegas pools that were a bit. how you say, unsavory. The pool at Paris is huge and clean and perfect on a hot summer day. Our family found plenty of room to splash around without running into others doing the same. And the large family group that started line dancing in the pool was an added treat. They are really good! After cooling down, we decided to take a ride to the top of the Eiffel Tower Experience. No stairs for this Paris – the elevator whisked us from the casino floor up 46 stories to the very top of the tower. 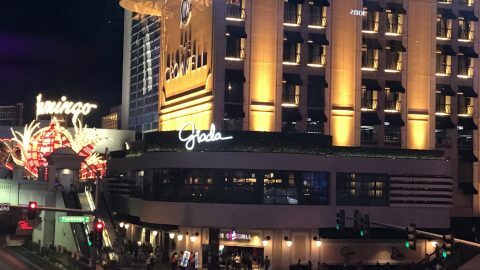 Once on the observation deck that encircles the top of the tower, we had unobstructed 360-degree views of Las Vegas and the surrounding valley and mountains. The landscape was really put into perspective for us, as we pointed out Downtown Las Vegas in the distance, the airport nearer than we thought, and of course the hotels and the Strip below. 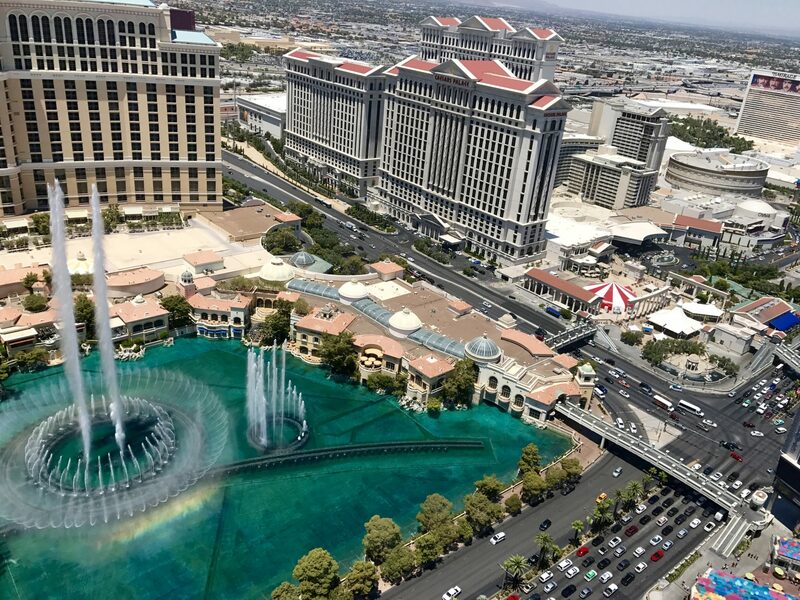 From this height, the thunderous water jets of the Bellagio fountains were even more dramatic. We paused for the entire duration of the show, mesmerized by the dancing waters from our perch above the Strip. 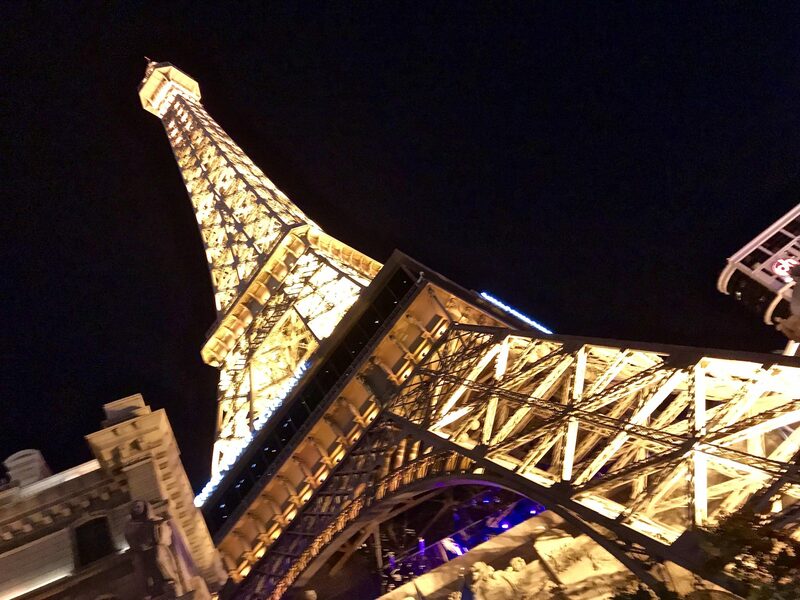 One of our favorite thing at Paris Las Vegas is its location, right in the middle of the strip and next to Planet Hollywood Resort & Casino, Bally’s, The Cromwell, Caesars and Bellagio – all within short walking distance. One afternoon, we walked over to the Miracle Mile Shops at Planet Hollywood next door, and the girls went crazy with back-to-school shopping (although I don’t know how we ended up buying bath bombs at Lush, but they are OBSESSED.) After all that spent energy in the shopping mall, we were hungry and headed to Gordon Ramsey Burger for – you guessed it – burgers. And incredible burgers they are, full of designer ingredients and sporting patties the size of my head. What a great experience for the entire family – we will definitely return again soon. 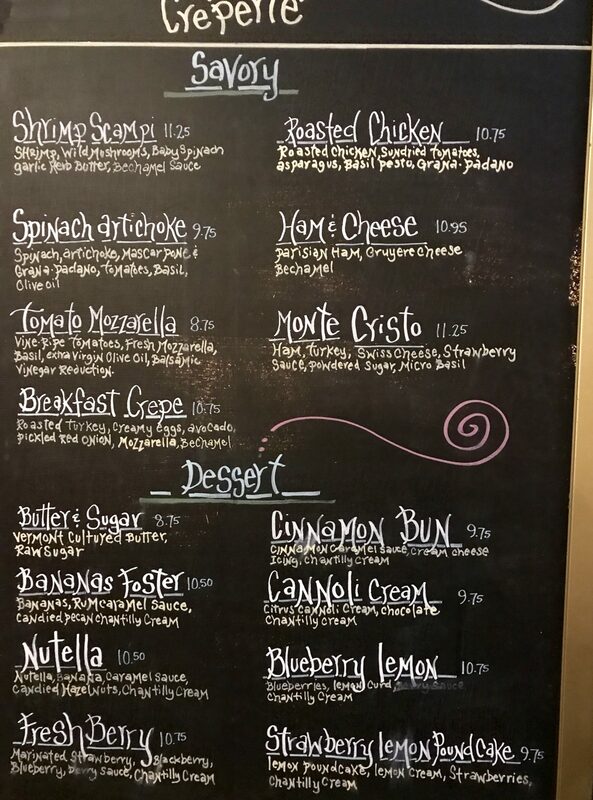 Wow the creperia seems to have a pretty extensive menu! And nothing can beat a good view! Glad to see that you had a great stay with your family there! Would love to be in Vegas soon! I’ve still not been to Vegas! Seems like something I have to do at some point in my life! How was the food quality and customer service?